Starting from 27 May 2017, diners can engulf their senses with a feast of more than 100 dishes including Malaysian classics enjoyed during the fasting season. Not only that, be spoilt with an all-you-can-eat tropical fruit fiesta and durian, the king of fruits (subject to seasonal availability) at the ‘urban tropical oasis’. 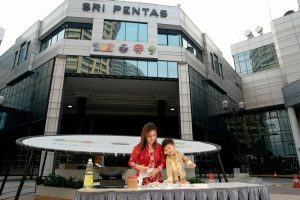 The breaking of fast buffet dinner is inclusive of the all-you-can-eat tropical fruit fiesta and is priced at RM145nett per person and half price for children from 6 to 12 years old. Early birds will enjoy the buffet at RM110nett per person from 27 May to 2 June and 17 June to 24 June 2017. Imagine indulging in the king of fruit and other delicious local fruits with the gorgeous view of our iconic Petronas Twin Towers. It’s an experience not to be missed. Meanwhile back to the buffet dinner, divers cuisine and delicious flavors awaits for you to break your fast at TEMPTationsS and Dynasty Restaurant (pork-free). Classic flavors to be savored include Biryani Gam Ayam, Sup ‘Gearbox’, Ayam Masak Daun Limau Purut, the all-time favourite Roasted Whole Lamb with Percik Sauce, Serawa Durian with Glutinous Rice and the must-have beef or chicken Bubur Lambuk that will be available every evening throughout the fasting month. Meanwhile, for a unique breaking of fast dining experience, diners can opt to go for contemporary Cantonese cuisine at Dynasty Restaurant where Executive Sous Chef Kok Chee Kin dishes out four (4) creatively crafted set menus. His two (2) 8-course menus are priced at RM138nett per person and RM168nett per person for a minimum of two (2) persons, a 9-course menu at RM638nett for five (5) persons and a 10-course menu at RM888nett for five (5) persons. Specials from the menus include Baked Lamb Rack with Piquant Mongolian Sauce, Casserole of Beef with Vermicelli in Satay Sauce, Crispy Farm Chicken with Spicy Minced Garlic, Baked Cod Portugese Style and Stewed Oxtail with Radish in Casserole. All the crafted set menus at Dynasty Restaurants are also inclusive of the all-you-can-eat tropical fruit fiesta so hurry up and make your reservations now. Ayden is such a happy boy! Smiling so sweetly! I like all the food here but sadly I could not even taste one mouthful of each because can’t eat that much.